We often see smartphones leak a half-dozen times before primetime, but things aren’t usually as juicy on the fitness tracker front. Unless you’re dealing with the Samsung Gear Fit 2 that is, as the upcoming wearable has just leaked again ahead of an official launch. Last month, the Samsung Gear Fit 2 and the Gear Icon X leaked to give us a good look at a couple of new accessories from Samsung. Not long after the original leak, both gadgets leaked again… and again. Now we’re back with another batch of photos showing the Samsung Gear Fit 2, and it’s our best look at the fitness tracker yet. 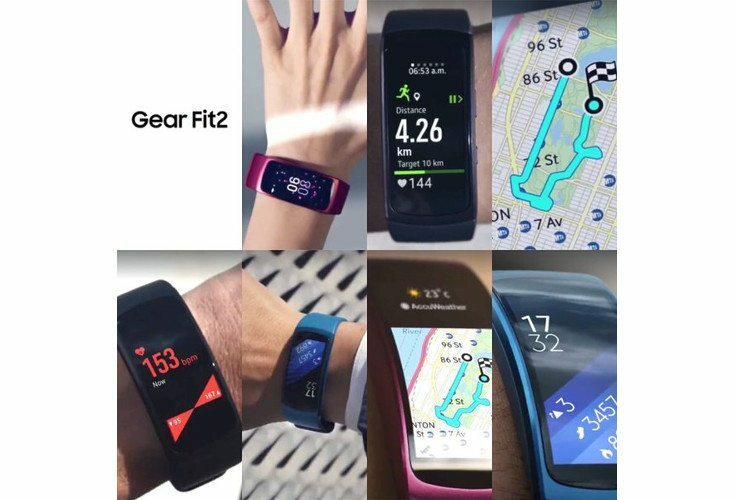 It would be a stretch to call the original Samsung Gear Fit unique as the wearable could have been mistaken for several other fitness trackers. While good looking, it didn’t really stand out although the same can’t be said for the Samsung Gear Fit 2. As you can see from the new photos, we’re going to have a Super AMOLED panel on the new model, which is also rumored to have GPS and 4GB of storage. Sammy’s new bio-processor is said to run the show, and while it will work like the previous model, there could be a few surprises in the software department this time around. Normally we tell you to take leaks with a dose of salt, but the Samsung Gear Fit 2 has leaked enough to where we feel confident in the design. That AMOLED panel looks good, and we think Sammy’s new tracker may do well if the price is right. We’ll have to wait a bit longer to find out what that will be as the company is expected to show off the Gear Fit 2 next month.